Filming will begin in September. Synopsis: In the multiplayer online game Glory, Ye Xiu, is well known as the Textbook level expert and a top-tier player. Due to a series of circumstances, he was forcefully expelled out of his professional team. After leaving the pro gaming scene, he resides at an Internet Café employed as one of the managers. When Glory launches the tenth server, he throws himself into the game once more, equipped with ten years of gaming experience, memories of the past and an incomplete self-made weapon. His journey back to the top begins. I read that the English sub is decent but since then they have hired a new translation team so supporting the main channel will help the future of the anime. You can also read the novel translation here. 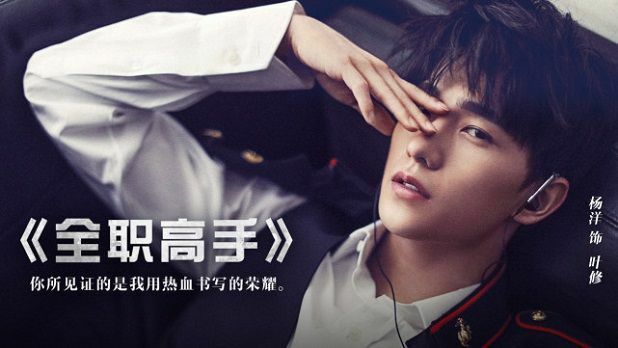 This entry was posted in Entertainment News and tagged Author: Butterfly Blue, Cdrama, Novel Adaptations, The King’s Avatar (全职高手), Yang Yang by Kappy. Bookmark the permalink. The animation’s REALLY good…the art’s fantastic too. I like the first episode of the animation so much that I decided to read the translation of the novel and finished 600 chapters in less than 2 weeks…before finals week too. Bad decision. But anyways, the mediocre translation has it in full but I’m reading the translation by Gravity Tales which has pretty awesome quality translations, but is also only at chapter 630-something. It does update every night tho. Also the novel has a total commitment of 1700-something chapters so people beware. It’s REALLY good. It’s almost literally allll about gaming and esports so also beware. BUT as someone who has never played a MMORPG or really any video game in my life, I can tell you that they do a REALLY great job of introducing the gaming world and goes into enough depth and detail that even gamers do find it interesting and fairly accurate. I’m NOT sure how that will work as a drama adaptation tho. Especially since I can’t see Yang Yang playing the character Ye Xiu very well. Ye Xiu is super shameless and hilariously deadpan…Yang Yang so far has played roles that have limited expression and stuff so…idk. Also Ye Xiu’s supposed to be average and forgettable in looks. Plus there’s a LOOOOOOT of material to cover. And idk how well all the gaming aspects will translate over well. In terms of gaming-heavy, King’s Avatar makes One Smile seem amateur on a newborn to centenarian level. The only plus I can see to this adaptation is that since the animation is sticking decently close to the main pts of the novel, both novel and animation are romance free with maybe a hint of possibility by the end. I really want to see SuMuCheng/YeXiu happen so considering how far from the novel drama adaptations usually are, I see a higher chance of them adding in the romance for the drama for higher marketability or something. Drama adaptations almost always add in romance where there isn’t so…that’s literally my only upside IMO to this adaptation happening. Either way tho, I might check it out just cuz I’m like insane about this novel. I dozed off watching the first few episodes of the cartoon. Then, it got better. Haven’t decided whether to read the novel. Too many looooong novels on my electronic book shelf already. Hope this won’t be like Fighter of the Destiny that the animated series seemed to end at season 2, not even close to being finished, followed by a terrible drama. The plot is very very familiar, is there a manga on top of the anime as well? Wonder where did I read this synopsis before. The book sounds interesting! Maybe I will try it, but 1700+ chapters sound daunting! Looking forward to more new dramas from Yang Yang!!! I wonder how “interesting” it’ll be though. I mean, you’re just watching people play 1-on-1 PvP (I can’t remember actually, think there’s also a 5v5). Plus, I’m pretty sure the game is not a real one which means that they’ll have to get a sponsor. What game they base it on will matter. I’m just not sure whether I want to see people seating in front of a screen and playing a game which has no story. I actually like watching gameplays, just not this type of gameplay. Tencent video is advertising the actual game at the end of the cartoon. I’m pretty sure they’ll do the game parts the same way they did with love 020 so you’ll be watching the actors acting as their game avatars in game ( as if it was VRtype game). I’m guessing the directors aren’t stupid enough to make a drama that consists mostly of people tapping away on their keyboards. A large part of the story/gameplay happens with dungeons and field hunting and the PvP stuff doesn’t take up that much in the beginning. The bulk of the PvP is pro-gamers competition stuff and a lot of those matches are also team based.it’s pretty exciting if you look at the way it’s shown in the books. The gaming parts are really well written and researched so I would say give this show a shot. Although I think yangyang is too pretty to fit the image of ye xiu, I’m so excited to see this novel dramatized and to see yang yang in more dramas! The rumoured female lead is Dilraba. His choice of roles are… typical. He really needs to choose mature roles and stop with these idol-y roles if he wants to be taken seriously. Like Chloe said, he is still young (26), so no harm taking such idol type roles. Actors like Hu Ge and Wallace Huo also took up idol type dramas around his age and even at 30 years old. I would rather him hone his acting skills at this age and really cement his position with a truly great role few years later, like Hu Ge. Hes still young so might as well take advantage of it imo. Plenty of years ahead to take on more serious roles. Well, I’ll take more Yang Yang on the tv screen but I am a bit disappointed by this choice. For an actor who seems to talk frequently about wanting to choose different types of roles–stuff that will allow him to grow and mature as an actor–this choice seems suspiciously safe. Actually it seems like the cynical choice of a management group that wants to keep making money. Ye Xiu is superficially a good fit for Yang Yang and he’ll get to glide from big license to big license (Wu Dong Qian Kun to this). This is a move almost guaranteed to keep him in the idol drama spotlight and flooded with endorsement offers. All of which is fine but I would have been interested in seeing him do something … different. I seriously screamed a little at work when I saw this. Holy crap, I’ve been waiting to hear about an drama adaption for this since the anime started airing. I’m so excited. Not sure about the casting choice through. I love YY but he’s so… dapper-looking and YX is so… not. Ah well, I don’t mind too much since I’ll enjoy seeing his face on my TV (that and I honestly usually care about the female leads a lot more…. haha).